"I'm not good with money"
This is how I've viewed myself for a really long time. Maybe even my my whole adult life. Growing up we didn't have a tonne of money, but my parents made sure I didn't go without. I got my first job at 17, and instead of saving my money, I used it for lunches, clothing and fun. I felt entitled to spend it however I chose since I was the one earning it. I acquired my first major debt at 19 when I took out a student line of credit and a student loan to put myself through musical theatre school. I got my credit card towards the end of musical theatre school. And when I got my first "grown up" job following college, I still didn't place my focus on budgeting, saving or paying down my debt; I continued to do whatever I wanted with my money. Over the years I've continued to pay down my credit line and student loan slowly, but have managed to rack up my fair share of credit card debt. Up until last year, even when I was working jobs that paid me well, I still didn't take the time to learn more about budgeting or saving and wrote it off to "I can do what I want with my money" and "I'm just not good with it". The limiting beliefs we have about ourselves can be paralyzing. You may not even realize that you have them. 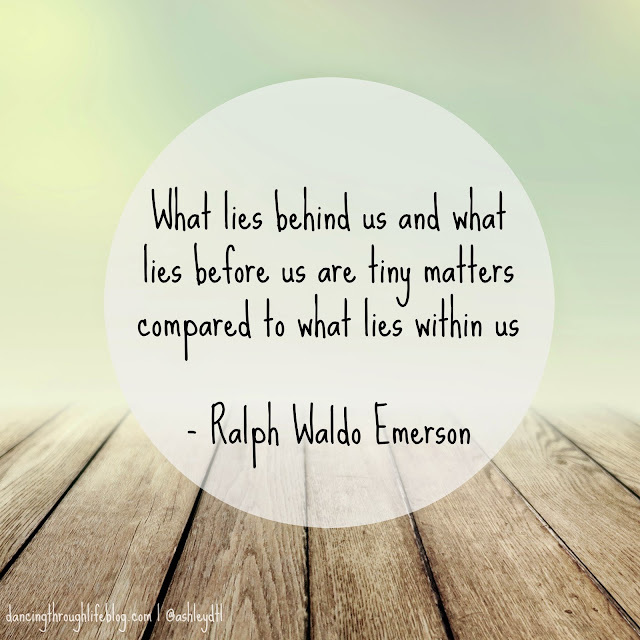 Are there thoughts you have about yourself on a regular basis that are holding you back? Do you find yourself making flippant comments about a certain personality trait or quality? Are there certain qualities you admire in others and deep down inside you wish you possessed? These beliefs that we hold about ourselves are the things standing in the way of achieving success. Once we start believing something, our choices and actions follow and your limiting belief has the ability to become a self-fulfilling prophecy. The amazing thing about life is that we get to make choices. And while it can be difficult to re-program our brains and our thoughts, it can be done and we can leave those limiting beliefs in the dust behind us. Start by determining what's holding you back - maybe it's something from the list above or maybe it's something different entirely. Once you start to recognize patterns in your thoughts you can move forward in addressing and challenging them. Don't be afraid to ask for help - it can be super scary to ask for help in any area of our lives, but especially the ones that may be holding us back. But it's okay, and it's totally a good thing. Asking for help will look differently for different people. It might mean seeing a counsellor or therapist to work through some of your "stuff". Maybe it's hiring an advisor or coach to help guide you. It could even be finding a book / blog post / podcast to start steering you in a new direction. Whatever the help, it's out there and you deserve to utilize it. Find a new mantra - turn that limiting belief around into something positive and say it 'til you mean it. Repeat it to yourself daily. Initially you might find this new mantra laughable because it's the exact opposite of what you've believed for perhaps as long as you can remember - and that's okay. The saying "fake it til you make it" applies here; give yourself some time to get to know your new mantra and really adopt it as your own. Watch what follows. Make a plan and run with it - once you've turned your limiting belief on its head, set some shiny, new goals and make them happen! Ridding yourself of the things that have been holding you back can be very freeing and can open up a multitude of new doors. Open them and just go. Trust that you are enough - because you are. When you can leave your limiting beliefs in the past, you can open yourself up to a world of possibility, positivity and new adventures. It's certainly not easy, but it's worth it - what do you have to lose? Yesterday I met with a financial advisor. When he asked me about my goals, I said "I want to work on finally dealing with my debts. I want to work towards saving and having a reserve. I'd like to learn how to budget. I want to work on being a grown up". For me, this was a HUGE step in leaving my limiting belief in the past and working with a new attitude of abundance and positivity in this area. I left with some extra pep in my step and excitement about the future, and that's a pretty awesome way to feel. If you are looking for help to overcome your limiting beliefs relating to healthy eating, fitness and setting goals, I'm looking for 8 people to join me in a group beginning on Monday June 8, 2015. I'm so excited to be offering this group. We're going to tackle clean eating, incorporating exercise and goal setting with 3 weeks of daily assignments, incredible workouts, meal planning tips, videos and resources. I'm also offering an amazing personal development book as a special bonus from me to those who reserve their spot before Friday May 22. You can grab your application here.